Submitted by KAT on Wed, 06/24/2009 - 9:13am. Cross-posted from The Green Fork. This 4th of July, let's declare our freedom from the "pharmo-petro-chemico-military-industrial-agribusiness" food chain, exemplified by Stephen Colbert's funny but creepy Carlyle-like Prescott Group. Give your patriotic picnics and potlucks a truly independent flavor; serve foods grown "locally, deliciously, and sustainably," as the Food Independence Day campaign is calling on all of us to do--including our elected leaders. And please, before you dismiss this as just another frivolous feel-good PR stunt, be aware that Food Independence Day is the brainchild of Roger Doiron, the Kitchen Gardeners International founder who led the call for the White House kitchen garden, which has yielded more produce--and more publicity--than even Roger could have hoped. Yes, he did! And he will, with your help. But don't stop there. Join me in declaring a war on our tired policy of declaring wars, whether it's the war on terror, the war on drugs, the war on poverty, the war on whatever. This habit of framing everything in violent terms impoverishes us all. In fact, our fixation on making a killing, as opposed to making a living, is what's brought our economy to the brink of collapse, as venture capitalist/eco-preneur Woody Tasch argues brilliantly in his new book. The title, Inquiries Into the Nature of Slow Money: Investing as If Food, Farms, and Fertility Mattered may be a mouthful, but it's one I'd love to see on everyone's lips, because this book gets right to the heart of everything that's ailing our economy and corroding our culture. Tasch's book is, in part, about how bad business decisions keep us from having good food. But it's not your (organic) garden-variety indictment of industrial agriculture. Yes, his "Slow Money" concept borrows freely from Italy's Slow Food movement--which famously began as a revolt against a McDonalds in Rome--and Slow Food founder Carlo Petrini wrote the forward to Tasch's book. But Slow Money is not some kind of simplistic, anti-corporate, socialist rant. Rather, Tasch offers a formula for a new kind of capitalism in which farmers' markets and stock markets both flourish. Tasch's economic agenda is founded on the heretical notion that we need to think about the long term consequences of how we invest our natural resources and our human capital, instead of dwelling on quarterly profits and worshipping the false gods of convenience and consumption. If we weren't so shortsighted, and so enamored of easy money, we'd be less vulnerable to scummy scammers like Bernie Madoff, the sleazy money lenders, and all the other charlatans who helped create this recession. We might learn to think of our housing as shelter, first and foremost, and long-term investment--not an asset to be flipped, or an ATM. We might also be more willing to confront the serious problems that plague our industrialized food system, as documented in Food, Inc. But we remain convinced that the hallmark of a healthy economy is endless growth, overlooking the fact that some growths are malignant. And what about growth that's achieved through artificial means? We object to our athletes abusing steroids, but we're told that injecting cows with hormones to squeeze more milk out of them represents progress, as does saturating our soil with chemicals that deplete it and clog our waterways with runoff. As Michael Pollan points out in Food, Inc., the way we eat has changed more in the last fifty years than in the previous 10,000. In those fifty years, Tasch notes, we've shifted to a food system that "treats the soil as if it were nothing more than a medium for holding plant roots so that they can be force-fed a chemical diet." Tasch tallies up all the trade-offs we've made in the name of progress that have actually eroded our standard of living; for example, the way we've sacrificed freshness for shelf life. He laments the "economic violence" that permeates our culture of consumption and proposes a radical rethink of our current values--not just the way we do business, but our entire way of life. Slow Money cites an eclectic range of thinkers, including some of our greatest agrarian philosophers and naturalists, as well as business leaders, professors and economists, who help Tasch make his case for an enlightened, re-localized food system that could bring us wholesome foods affordably without degrading people, animals and the planet. Sound impossible? It's really our only hope. Don't believe the disinformation campaign being spun by Agribiz lobbyists, about how 'organic agriculture can never feed the world'. Foodie blogger extraordinaire Jill Richardson took on that monocrop myth in a Daily Kos diary on Monday. We have to come out of this decade with drastically new ways to raise food. These ways have to use natural systems channeling solar power through crops, pasture and humanely raised livestock that builds soil carbon, doesn't pollute our water and increases economic opportunity for food producers in rural and urban areas. Organic can do this, and it's doing it now, and with the declining supplies of fossil fuels, it is the only real future we have. Tasch seconds this sentiment, but he doesn't just explain why our current system of food production is unsustainable. He offers credible examples of alternative food chains being built one community and one entrepreneur at a time. 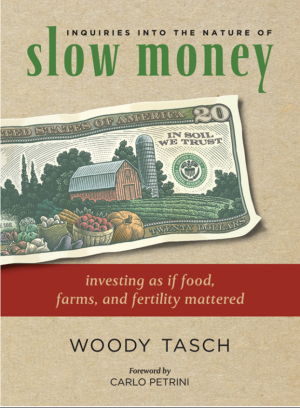 His expertise and success in both for-profit and nonprofit endeavors, combined with Tasch's understanding of the fundamentals of soil fertility, make Slow Money a must read if you're feeling overwhelmed by the problems of our food chain and want to know how we can move forward. Joan Gussow, through whom I first learned about Tasch and his book, said of him, "He just may be a genius. No, let me amend that. He is a genius. He just may save us."